Christmas morning is over, we've opened the presents and we now know who the lucky 65 dancers are starting with the annual play-in game in Dayton, where Coppin State and Mount St. Mary's will battle it out for the right to get devoured by North Carolina by 50 on Friday. Let's get it on!! All right, now these are my initial gut reactions, predictions, and observations. I do reserve the right to change my predictions between now and Wednesday night as these are knee jerk, no analysis picks. And, yes, I will post my final bracket predictions here on Wednesday night. First, let me say that none of the "snubbed" teams left on the outside looking in have a gripe. The closest team to a true "snub" would be Arizona State who actually beat Arizona twice and had a better record in the same conference. But even Arizona State was a "one and done" waiting to happen. As for the rest of the jilted -- Ohio State, Dayton, Illinois State, Virginia Tech (Seth Greenberg, nice try on the lobbying. Too bad they count the whole season, not just one close loss to UNC), et al -- you all had chances to seize the day. You didn't. Have a New York slice for me when you get to MSG for the NIT Final Four. As for the teams that did make it, while last year gave us all kinds of chalk advancing (Gambling tidbit - favorites were a torrid 22-10 against the spread in the first round alone), including two #1's and two #2's going to the Final Four, I think we'll see some lower seeds make more noise this year. So with that said, here are my "live" teams for each numbered seed -- in other words, the team at that seed that has the best chance to make some noise and plunder brackets everywhere. MOST LIVE 16 SEED - NONE. A 16 seed has never beaten a 1 seed in the history of the tournament. Don't waste your time trying to find one this year that will. Predicted average margin of victory for the 1 seeds in the first round: 38 points. MOST LIVE 15 SEED - BELMONT (West) Picking a 15 seed to win a first round game is almost as big a suicide mission as picking a 16 seed. But I guess if you're looking for one who might stand a chance of keeping it interesting for a while in the first round, check out Belmont against Duke. The Bruins are not a very big team, but Duke is certainly not big enough themselves to totally exploit that. Also, the Bruins beat Cincinnati and Alabama on the road this season so they've competed against and beaten legit big conference teams. Neither of them are Duke, but hey, what the hell do you want from me? It's a 15 seed, for crying out loud. MOST LIVE 14 SEED - GEORGIA (West) This is an easy one. How would you like to be Xavier? Just a week ago you were in the mix for a two seed, then one bad night later you are sitting at a 3 seed opposite one of the hottest teams in the country in 14 seed Georgia. Ouch. The Bulldogs' Sundiata Gaines is a solid point guard who can neutralize Drew Lavender (who's battling an ankle injury), and the Bulldogs also have some size inside with Dave Bliss and Albert Jackson. More than anything else, after a season where they endured everything from players being suspended to guys quitting over playing time, Georgia is going to come in loose and playing like they have nothing to lose -- which is exactly what Xavier didn't need to see. If you are ever going to pick a 14 seed over a 3 seed, this is the time to do it. MOST LIVE 13 SEED - WINTHROP (East) After knocking off Notre Dame last year for its first ever tournament win, Winthrop is looking to build on that success in 2008. It was widely assumed they would be ceding the Big South throne after going through a coaching change with Gregg Marshall leaving for Wichita State, but here they are again. The Eagles knocked off Georgia Tech and Miami this year, the latter on the road, and played one of the nation's toughest non-conference schedules. They will not be intimidated by a Washington State team that plays a similar style and is a little overrated, in my opinion. This will be a tight game, and if Winthrop pulls off the upset, guess who's likely waiting in round 2? Notre Dame. MOST LIVE 12 SEED - TEMPLE (South) Sticking with the theme of hot teams winning conference tournaments, the Temple Owls were on fire down the stretch, winning their last four regular season games to finish second in the Atlantic 10 and then chasing that with an A-10 tourney win to get the automatic bid. If you're looking for a 12 seed that has the March Madness formula covered, the Owls are it -- great guard play (Dionte Christmas and Mark Tyndale), protect the ball well, good foul shooting. Combine that with the fact that they are facing a very inconsistent Michigan State team, and I think there's a decent chance we could see two of the hottest teams in the tourney (Pitt and Temple) battling in round 2. MOST LIVE 11 SEED - BAYLOR (West) I'm actually not crazy about any of the 11 seeds. Kentucky is a "one and done" waiting to happen, Kansas State has ranged anywhere from enigmatic to awful during the last month, and St. Joe's is just all right. Which brings us to Baylor. They play a Purdue team in the first round that overachieved all year and can be had. The truth of the matter is that if Curtis Jerrells and company are knocking down shots, they have a very real chance at the Sweet 16, with the Xavier-Georgia winner awaiting them in the second round. MOST LIVE 10 SEED - DAVIDSON (Midwest) Again, I'm not crazy about the 10 seeds in this tournament. Davidson is led by Stephen Curry, son of former NBAer Dell Curry. He'll be following in dad's footsteps someday. The Wildcats played Duke and UCLA tough this season and went undefeated in their conference. The Gonzaga-Davidson game will be one of the best of the first round. MOST LIVE 9 SEED - KENT STATE (Midwest) One of the hottest teams in the country coming into the tournament, the Golden Flashes jumped into the public consciousness with a Bracket Buster win at St. Mary's a few weeks ago. They are a versatile, athletic team that could hang around with Kansas in the second round for a while. MOST LIVE 8 SEED - MISSISSIPPI STATE (South) There might not be a more quietly consistent big conference program than Mississippi State as they won the SEC West for the fourth time in six seasons. Led by All-SEC performers Jamont Gordon and Charles Rhodes, the Bulldogs are one of the top defensive teams in the tournament and are athletic enough to give Memphis trouble in the second round. MOST LIVE 7 SEED - WEST VIRGINIA (West) For the record, this now makes four "live" seeds out of eight teams total coming out of the Washington, DC subregional. So if you're looking for a spot on the bracket to try some upsets, you know where I stand on this topic. As for the Mountaineers, Bob Huggins has transformed them into a very efficient hybrid of what they were under John Beilien (three point gunners) and classic Huggy Bear Ball (hard nosed and scrappy). Joe Alexander has quietly put together one of the best post seasons of any player in the country, averaging around 30 a game in the Big East tournament. The coaching matchup in the first round (Huggins vs Kevin O'Neill) is a total mismatch, and WVU will give Duke all they can handle in the second round. I'm taking Duke right now, but reserve the right to change my mind before Thursday. MOST LIVE 6 SEED - USC (Midwest) Most people when they think of USC immediately think of OJ Mayo, but the fact of the matter is this is a pretty balanced, talented bunch that is playing its best basketball heading into March. Also, Tim Floyd is a very good game coach with his various defensive schemes; all you have to do is watch the Memphis game from earlier this season when the Trojans took the Tigers to overtime before losing to understand that Floyd is an equalizer in matchups where the Trojans have less talent. Mayo is a star in the making who can put a team on his back. This team can go to the Elite Eight and can absolutely give Kansas all it can handle in the regional final. MOST LIVE 5 SEED - CLEMSON (Midwest) Clemson spent the entire season as the clear third dog on the ACC, which is fine. Good enough for a five seed. They took UNC to overtime twice in the regular season before losing in the ACC finals to the Heels. Clemson is deep, athletic and balanced. The Achilles heel is foul shooting, where they barely crack 60% as a team. That will cost them in a close game. MOST LIVE 4 SEED - PITTSBURGH (South) This is a typical Jamie Dixon Pittsburgh team - a bunch of athletic, mentally tough street brawlers. We saw that in spades in the Big East tournament where they won four games in four days in arguably the toughest conference in the country. Sam Young is an all-Big East performer but the x factor on this team is point guard Levance Fields, who missed a large portion of the season with a broken foot. When he's healthy, Pitt is one of the top 10 teams in the country. Memphis has faced maybe one other team this year that busted them in the mouth the way Pitt will in the Sweet Sixteen, and that was USC who took the Tigers to overtime. MOST LIVE 3 SEED - LOUISVILLE (East) Forget about losing to Pitt in overtime in the Big East tournament. Louisville heads into the tournament playing its best basketball of the season, winning 11 of 13 down the stretch in the regular season. Rick Pitino has this team playing his style of ball, especially defensively where they combine full court pressing with a 2-3 zone in the half court to make life very uncomfortable for their opponents. I am picking Slick Rick and the Cards to go to the Final Four. MOST LIVE 2 SEED - TEXAS (South) Admittedly, once you get into 2 seeds and 1 seeds, they all better be "live". Texas gets the nod here because they have two things going for them -- (1) DJ Augustin, who is the best player on any of the #2 seeds, and (2) a de facto home court advantage in the regional final. They also have as many quality wins over elite competition as any team in the country with wins over UCLA, Kansas, and Tennessee. MOST LIVE 1 SEED - UCLA (West) The best, most versatile team in the country (my opinion) combined with the weakest of the four regions equals a high probability of three Final Fours in a row for Ben Howland and his crew. 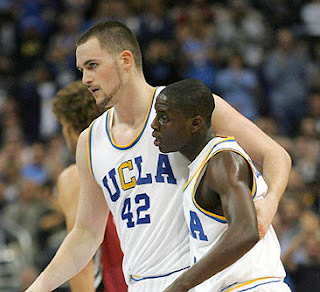 Kevin Love's back spasms are a little concerning, but if he's right, UCLA is the best team in the country in a tournament format. The pundits all seem to think that the East Region is the toughest of the four, but I disagree. I think a key component of the difficulty of a region lies with how strong the middle seeds are. The top three seeds in each region are always going to be strong, but it's how tough the seeds 4 thru 12 are that swing the vote. (I will say that I'm not crazy about Wisconsin at the 3 seed, though.) I think 5 Clemson, 6 USC, and 7 Gonzaga are all talented enough to make runs to the Elite Eight. 9 Kent and 10 Davidson are the strongest of the 9 and 10 seeds in the tournament, and 11 Kansas State has the best player in the country in Michael Beasley. Potential Sweet 16 Matchup that could rock - USC vs Georgetown. The most hyped freshman coming into the season (OJ Mayo), who has at times lived up to the hype, taking on one of the most storied programs of the last thirty years. Watching Tim Floyd's athletes D up against the Princeton offense would be fascinating to watch. Would Roy Hibbert finally establish himself as a premier big man? See! I don't even have the East as the second toughest region in the tournament. The committee sure didn't do 1 Memphis any favors, placing them in the same region as 2 Texas with the likelihood that they will clash in Houston (advantage Horns) for the right to drive down I-10 to San Antonio. Also, the committee placed two of the hottest teams of the post season in this region in 4 Pitt and 12 Temple. 3 Stanford could cause problems for 6 Marquette and Texas with all of their size inside, and 7 Miami came on strong down the stretch to lock up a 7 seed. Memphis' potential path to the Final Four of 8 Mississippi State, Pitt, and Texas is pretty daunting considering the various styles of play and the games being played in Houston (if Texas gets to the regional final). Potential Sweet 16 Matchup that could rock - Texas and Marquette would be a good one on the one side of the bracket, but the one I really want to see is Memphis and Pitt. Memphis with it's "40 minutes of hell" circa 2008 versus Pitt with it's street brawling, classic Big East style would be a mind blowing contrast in styles. Watching these two team try to impose their respective wills on the other would be some sweet March deliciousness. Why am I ranking the Eastern region third when everyone else (Digger, Bilas, Vitale, etc) are conceding it's easily the hardest? Well, frankly, I'm just not overly impressed with the "meat" (i.e. 4 thru 12) of this bracket compared to the Midwest and the South. But before I get to the "meat", let's start at the top. I think 1 UNC can be had. I know their style of play is not conducive to putting up great defensive numbers, but they had way too many average teams put up big scoring nights on them this year. Also, they're extremely careless with the ball. Maybe that will change with more focus come tourney time, but I tend to think that you are what you are, and UNC turns the ball over too much against athletic teams to think that it can't hurt them in a "one and done" scenario. I'm not wild about 2 Tennessee either. Ever since they knocked off Tennessee (and Bruce Pearl started texting Erin Andrews on a regular basis), they've looked sloppy. They also don't shoot free throws well which will bite them at some point. I actually like 3 Louisville a lot in this region. I think their full court pressing and athleticism matches up well with UNC and Tennessee and I like David Padgett as a very underrated big (and a perfect fit in Pitino's offense). As for the aforementioned "meat" of the region, 4 Washington State is a bit overrated to me, 5 Notre Dame struggles away from home against athletic teams (which this region is full of), and 6 Oklahoma is a decent Big 12 team, nothing more. I think 7 Butler couldn't have asked for a worse region to land in given their limitations size-wise and athletically. And 8 Indiana looks like they've cashed in their chips on interim coach Dan Dakich. Just nothing here to really scare the big boys. Of the four, this region is the most likely to send the chalk to the Sweet 16. Potential Sweet 16 Matchup that could rock - Notre Dame vs North Carolina. While UNC is plenty athletic, I don't know that they play the in-your-face, extend-to-the-perimeter defense that has given ND trouble so many times this year (see Louisville and Marquette), and ND can run with the Heels. Take the over, because it would be an absolute scoring-fest. And watching Harangody and Hansbrough slug it out for forty minutes would be like watching the last two rounds of Rocky on a continuous loop. Seriously, if you're a college hoops fan, root for this matchup to happen. The worst matchup on the board for UCLA in this region is 4 Connecticut with all of their size and athleticism, but they're so Jekyll and Hyde, I could see them going to the Final Four or losing by 15 to 13 San Diego in the first round. At the end of the day, I think UCLA is the one team in this tournament that can play multiple styles of basketball and feel comfortable. The rest of the big dogs all seem to have areas of discomfort whereby if their opponent is able to dictate tempo, they're less proficient. Of course, this is all predicated on Kevin Love's back being 100%. If it's not, then Connecticut will beat UCLA. Potential Sweet 16 Matchup that could rock - This region honestly doesn't have that many potential matchups that get me jazzed up, but UCLA against Connecticut is very intriguing. Even with some of the good bigs UCLA has seen (Lopez's 1 and 2, Jeff Pendergraph), they haven't seen anything like Hasheem Thabeet. And Jeff Adrien is a beast at the power forward. Connecticut can match up with UCLA athletically, it would come down to how well Craig Austrie and A.J. Price protect the basketball.